Een complete gids hoe zelf een scheepje in een fles te maken. Leer alles over het maken van een flessescheepje. Captain Dan Berg's boek is anders als sommige stap voor stap handleidingen. In plaats van alleen maar een schema, leert u eerst de basis beginselen. Na het lezen van dit rijk geillustreerde boek heeft u goede kennis en inzicht in het bouwen van een scheepje in een fles. U leert hoe zelf een tuig voor uw schip te ontwerpen en hoe zowel dwars- als langsscheepsgetuigde schepen te bouwen. U leert hoe de basis principes toe te passen en u leert hoe u elk scheepstype kunt maken dat u wilt. Er bestaan vele technieken hoe een scheepje in een fles te maken. Sommige meer geavanceerd als de ander. Captain Dan kiest een basis recht-toe-rechtaan techniek. Een eenvoudige techniek die door iedereen geleerd kan worden en een techniek die Captain Dan zelf op al zijn modellen toepast. In dit boek ziet u voorbeelden van de mooiste en beste scheepjes die in een fles zitten. Leer van de meesters door de toegepaste technieken en details te bestuderen. Transactie verloopt via Clickbank. Veilig betalen met Paypal of creditcard en daarna direct downloaden. Unlike other books on the subject, that provide a diagram and step by step instructions Capt. Dan attempts to teach model builders to understand the basic principals involved. After reading this heavily illustrated text, readers should have a good understanding of how to design rig and build both square sailed as well as fore and aft rigged vessels. They will then be able to apply the basic principles and techniques and build any type of sailing ship they choose. Please note that there are many different techniques used by different builders in creating their ship models. Some use elaborate mast hinges while others contend with a maze of rigging lines which all run through and under the hull. This book teaches Capt. Dan's basic and the straight forward simple techniques that the authors uses on all of his ship in a bottle models. These basics can be enhanced and modified as model builders become more proficient. Capt. Dan has included a showcase of ship in bottle images from some of the best master model builders in the world. Often the best way to improve skills and technique is to examine the exquisite work and detail of these masters. The art of building a ship in a bottle dates back to the early 1800's. Sailors for centuries have crafted items during there long journeys away from home. They worked with supplies that were readily available to them and are responsible for some of the finest scrimshaw and models ever created. Exactly when the first ship was built and inserted into a bottle is unknown. Bottles older than the mid 1800's were often not clear enough to showcase a miniature tall ship. By the late 1800's good quality hand blown glass bottles were abundant. It was during this time that this craft was perfected. Models back then were often created out of whale bone and exotic hardwood. Many of these early examples are now housed in museums around the world. Unfortunately, times have changed for mariners and model builders. Far fewer of our youth now venture out to sea for adventure or to seek their fortune. With the advent of the internet and video games even fewer are spending any time carving or crafting any type of models. This books goal is to help stir up some interest in this ancient maritime art form and preserve the building techniques for future generations. Many people think that the miniature ship model is actually built piece by piece while inside the bottle. Others think it's a complete illusion and that the bottle is cut in half and then glued back together around the miniature model. Actually, the detailed ship model is built outside the bottle but it's designed in a way that allows its masts and sails fold flat. The model is then slid in through the bottles neck and then the masts are carefully pulled upright with string and a few handcrafted tools. Of course it sounds a bit easier than it actually is. With the information and techniques provided in this text anyone with a little creativity will be able to craft and display a quality piece of maritime art. Capt. Berg learned years ago the ancient mariners art of building a ship in a bottle. He has now put a how to book together which gives all the tricks of the trade so anyone with a love of maritime history, sailing or the sea can build their own piece of nautical art. Captain Dan Berg has worked in the SCUBA industry for over twenty years. He owns and operates the charter dive boat Wreck Valley. Mr. Berg has authored over a dozen shipwreck and diving related books and was the host and producer of the award winning Dive Wreck Valley TV series. Capt. Berg makes no claims at being a master model builder. He is only someone that loves the ocean, maritime history and the art of crafting these miniature tall ships. Let Capt. Dan show you the secrets of how to build a authentic ship in a bottle. This heavily illustrated ebook is 5.5 x 8.5, 64 pages, 6.5 MB and loaded with color photographs and sketches. This printable ebook is available for immediate download as a PDF file. Transaction via Clickbank. Safe to pay and direct download. 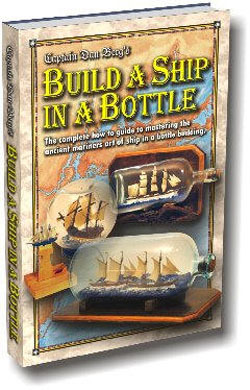 If you always wanted to make a ship in a bottle this is a good book to start with. It is clearly written and easy to understand. It comes with lots of full color photos and takes you through the whole process clearly and easily.